Warfare has never been as technologically advanced as it is today. Nor have the threats come from so many different directions. Just as cybercrime has entered our general consciousness, so too will cyber defense over the years to come. Cyber attacks are an increasingly frequent form of asymmetric warfare and France’s DCI Group is one of the foremost providers of solutions aimed at blunting such attacks. To do this, it has its own cyber defense consulting department, which it created in 2014. As an entity designed to pass on the expertise of the French armed forces to friendly clients and allied militaries, the DCI group has bases in France, the Middle East and south-east Asia. Its consultancy services cover all the stages of a cyber defense acquisition program, from design to management and implementation. DCI Group can assess your needs, draw up relevant technical and operational requirements and specifications, help you manage the bidding process and choose suppliers – in fact, do just about everything required to get you to the operational deployment stage. The company works closely in tandem with its clients, especially by means of joint workshop sessions. Like cyber attacks, electronic warfare is now a reality of the modern battlefield, especially in the skies above our heads. DCI group has teamed up with experts working for some of the biggest names in global defense (MBDA, Lacroix, Thales) in order to develop a variety of electronic warfare training courses. 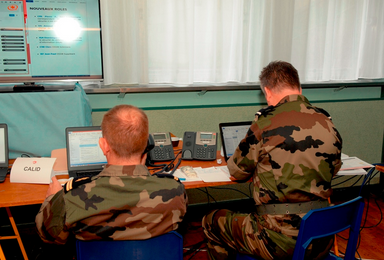 These courses essentially focus on electronic warfare as it affects air operations, and DCI group already has much experience training members of the French Air Force and its Naval and Army aviation services. Personnel from friendly armed forces in North Africa, South America, Southeast Asia and the Middle East have also benefitted from this training. ⟵Groupe EREN – getting the most from the world’s renewable energy resources!